I added a (small) new feature on 361points.com: the possibility to replay a random professional Go game. While I like the idea of randomness, I am not so sure this is tremendously useful, after all there are many other ways to replay random pro games – honestly I did it more as a programming exercise. 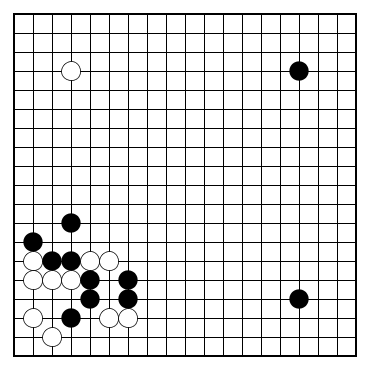 The actual pool of game records is composed of relative recent games (year 2000 and newer) that are freely available on the internet – mostly from the great Go Topics website. This feature is hosted on the main entry page for two reasons: 1. I don’t know where else to put it 2. For people new to Go that come to my site, it would be nice to actually see at a glance what a game looks like. Let me know what you think. You can read the whole article on the main website. I wrote a detail page for the “Study professional games” advice. It also touches on subjects as “to read comments or not to read comments“, and “try to understand or learn by heart“. Also, do you know this Google search trick to look for SGF files of Takemiya’s? Just google for Takemiya filetype:sgf and see for yourself. The filetype:sgf part of the search string is a special Google operator that limits the search to files with the sgf extension. Of course, you can replace Takemiya with your favorite Go player. I was contacted last week by David Mitchell asking if he could publish some content from 361points.com in Sydney Go Journal. He also sent me one of the issues, as an example. I liked the journal a lot, and I was wondering why it was the first time I have heard about it. David explained that this journal is normally distributed in PDF format through an email list, to Australian Go players. He agreed to have it hosted on 361points.com so that Go players from other countries can enjoy it as well. So here it is, all the issues so far in PDF format. The author, David Mitchell, is a strong amateur player with a lot of experience, so I am sure there is a lot to learn from reading his journal. (The PDF files are 1-2 MB large and may take some time to download, so I recommend you to download and read them separately, rather than viewing them in your browser). You may have noticed already that many pages on 361points.com have a new “Tags for this page” section on top: each tag is an attribute for the page, and clicking on, say, the lesson tag will bring a list of all pages that have “lesson” as a tag. This is intended as yet another way to explore the content on the website – let me know if you think it is useful. There is also a tag index page, where you can see an alphabetical ordered list of all the tags so far. Feel free to suggest new tags – just add a comment to this blog or through the anonymous feedback on the website page. There are some interesting points and questions users have brought via the anonymous feedback on the website. I am going to address here 2 of them. Of course it’s good to get advice from someone who has insei experience. I’m not sure fast games make people read faster, though. I think the temptation is to read *less*. Tsumego training can help read faster, though. I agree that blindly repeating joseki is bad, but White’s living technique in Dia. 8 is one I learned recently from studying a different joseki! Knowledge still helps you strong players to find the right way, even if it is non-standard. This comment is about my “Sometimes It’s Better Not to Know Joseki” article. I definitely agree that knowledge is power – the more we know, the more choices we have, normally, but what I described in this article is an instance of me only thinking in joseki terms in a situation when it was completely wrong to do so. I read in the AGS newsletter a while ago a comment of Janice Kim’s on joseki. I don’t remember the exact words, but it was something like “what if josekis didn’t exist”, so basically we just regard them as any other local fights. I liked that idea a lot! I want to thank everybody who left feedback, from encouraging words, to corrections on grammar, to suggestions on what to focus on – I am reading all of them and hopefully put them to good use! I added a few thoughts of mine on the 3rd and last game of Women’s Meijin in the tournament page. Just briefly, it is very interesting to study how Black is attacking a group in a sequence of 50 moves or so. It was not clear to me that the result of the attack favored Black in the end – as I was looking at the variations on Cyberoro there were a lot of them showing what looked to me as more profitable variations for Black – but Black keeping the initiative for so long surely payed off on the psychological side, with Aoki overlooking what must be a pretty simple tesuji for a professional. I updated the site design a bit recently, tried to make it more colorful. Since I am not a web designer, I realize it’s very far from looking even remotely pleasant – please let me know if you have any suggestion. I added a new page that lists the top pages on 361points.com, based on users ratings. It’s not listing the comments, but only the average rating for each page that is “rating-able” and has more than one rating. So far most of the ratings are positive, but there are only a few comments (all positive) – please don’t be shy to criticize if there is a page you don’t like, and more importantly comment on what you think can be improved. I consider changing the entry page for 361points.com from what it currently is (the “What is Go?” page) to some sort of short abstract about what the website is about. Here is the link to a possible entry page – it is just “in beta”, not used yet, or linked from anywhere on the page – please have a look and comment on whether you think it’s a good idea or not. Thanks!! Yamashita Keigo Kisei defended his title with 4 straight wins against Kobayashi Satoru. It was a young vs. senior match, and the young one won – which seems to be the rule in professional Go today, rather than the exception. See my coverage of this year’s Kisei title. I wrote a brief article on my rule of thumb when it comes to approach a “Kobayashi fuseki” formation. I added a “Search this page” control in the upper-right of each page on the 361points.com site, to make easier to find things around. This is powered by Google. Also, if you haven’t noticed that already, there is a “customized Go search” page, which only searches internet pages related to Go. Let me know what your favorite Go pages are and I’ll add them to the search list. I wrote a new article called “First Steps” intended to be a guide for people who just learned the rules. It used to be the end of the “What is Go?” – which is currently the entry point to my site – but I moved it to a separate page and rewrote it a bit. Writing the “first steps” page brought again to my mind the question: “what is the focus of 361points.com“? For now it’s a pretty general Go site, mostly around how to study Go, and my experience as a Go insei in Japan – I am still working on defining what the focus is I do plan to add some interactive features – hope to find the time and inspiration for those. Something that can help me finding the focus for my Go website is user feedback: besides the rating feature which I added a while ago, I also added over the weekend a comments area at the end of most of the pages: please use it in case you have suggestions/comments – it’s anonymous, so don’t be shy – thanks a lot in advance! For the first lesson with the same topic follow this link. And here is the index of all lessons I published so far. Most of these are lessons that I learned – the hard way – but I think others can benefit from them, too.